As noted in a previous Work Beyond Mac column, DeskConnect’s Workflow is a relatively new app that’s a bit like Automator for iOS. I like it, but I’m still figuring out how to put it to best use as a productivity tool. While it’s had a spot on my home screen since it was first released, I’ve used it largely to create animated GIFs and for other “fun” features. Now that I’ve been able to dig into the app some more—and spent countless hours (not an exaggeration) combing through Workflows posted on Twitter by fellow users—I’ve found some handy ’flows I think we can all benefit from. If you have Workflow installed on your iOS device, use it to view this post and tap on the name of the workflow (in blue) to install each one. Safari lets you download files, but let’s be honest, it’s a horrible experience. Tapping on a link to download a file results in you just sitting there, staring at Safari, waiting for it to show signs of life and then, out of nowhere, it randomly presents the option to open the file in another app. There isn’t a progress bar to be found; the entire process is very un-Apple-like. 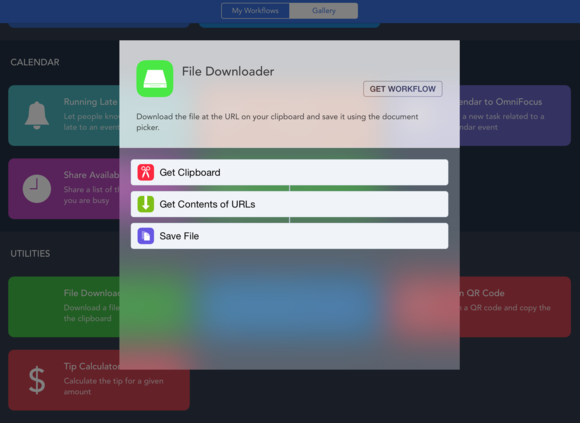 With this workflow, you can download a file of any type and save it to any service that integrates with iOS 8’s iCloud Drive file picker (Google Drive and Dropbox, for example). Best of all, there’s a progress bar. Just be patient, as you can’t leave the app while the file is downloading. File Downloader is an easier way to get files onto your iOS device. Capturing a quick screenshot and sharing it to another device I own or with someone in my office is something I routinely do (as, I’m sure, do many others). The process isn’t time consuming, but it can feel like a chore if you’re required to do it over and over. With this workflow you only need to tap an app icon on your home screen and select the person you want the screenshot(s) sent to. The ’flow will automatically select the last screenshot in your Camera Roll (you can change the number or have it prompt you each time it’s run), and launch the standard iOS share sheet. It’s nothing fancy, but it saves you some time over the long run. The inability to browse your entire iCloud Drive account from an iOS device is puzzling. As it is now, you need to launch an app that integrates iCloud Drive and then view your files. Depending on the app and file type, this can lead to a lot of bouncing around between apps. With this workflow, you can view your iCloud Drive in its entirety from your home screen. And, if you find what you're looking for, you can then download and open an item in the appropriate app. 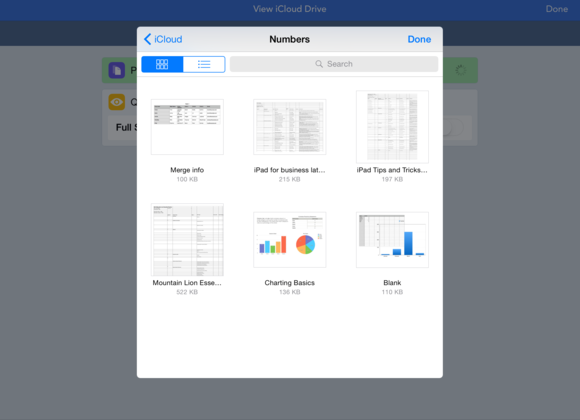 View iCloud Drive lets you see the files you've stored on Apple's cloud. You never know when inspiration is going to strike, but when it does you want to be able to quickly take note of it and move on. For me, I often find myself saving images embedded in stories and creating notes so I’ll remember something at a later time. Prior to this workflow, the process for saving multiple images from a web page was simple, but it wasn’t quick. After adding this ’flow to your library, you can use the share button to run the workflow and then save any and all images displayed within the extension. There are quite a few quality photo editing apps on iOS. Yet the process of opening an app, importing a photo, resizing it, and then exporting it back to your Camera Roll is so 2014. This year, when using an iOS device, I plan to exclusively resize photos with Workflow. Once you open the workflow, you can select the photo(s) you’d like to resize and then enter new dimensions. Or, if you always resize photos to the same dimensions, you can edit the actions with a hard-coded size (instead of being prompted every time it runs). After the image is resized, it will be saved to your photo library and displayed for your viewing pleasure. Creating a PDF is a hassle, no matter the platform. This quick workflow can turn any web page or text document with a share button into a PDF in just a few seconds. Once the PDF is created, you can then upload it to a storage service, email it, iMessage it, or send it to another app for further processing. 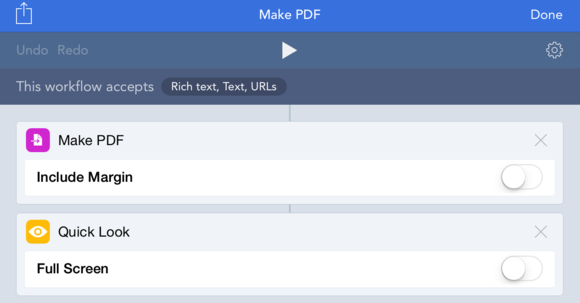 Create a PDF file in a jiffy with this workflow. When I was little I loved being read to, and now that I’m a grown up why should it stop? Well, finding someone willing to read me tech articles is a futile effort. But thanks to this workflow, found in the official gallery, I can have my iOS device read any web page to me. While researching a topic, it can be downright frustrating to come up empty-handed when you know a post or report was published on a specific site. Adding to the frustration, most sites’ search engines do a horrible job of finding relevant content. As you may know, Google offers a method for restricting your query to a specific website. For the unfamilair, you can enter "site:Macworld.com search query" (replacing search query with your respective, well, query). This workflow will take the site you’re currently searching and run it through Google. You only need to activate it through the Share extension. When traveling or bouncing from one meeting to the next, it can be a circus act to stay on schedule. The problem is only amplified if you have no idea where you’re going or how to get there. This workflow asks you which scheduled appointment you’re heading to and then opens Apple or Google Maps to give you directions. Pretty neat. Going through your schedule, trying to decipher the various color-coded bars in an effort to provide someone with a list of your availability on a given day isn’t fun. The next time someone asks you for your availability, launch this workflow from your home screen and let the app create a list of the times you’re available. You can then email the list or share it however you like. 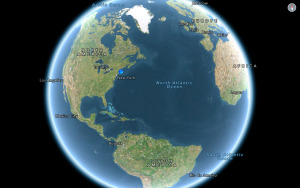 Workflow is capable of plenty more, and that’s what makes the app so exciting to use. With each passing day a Twitter search, app update, or new user brings something fresh to the app that we can use to get our work done. And when you find one you like, add it to your home screen, thus making it more readily available. You can do that by viewing a workflow, tapping on the Settings gear, and selecting Add to Home Screen from the list of options. Unsure if Workflow is for you? Check out our review. Have a favorite workflow? Share it in the comments below.